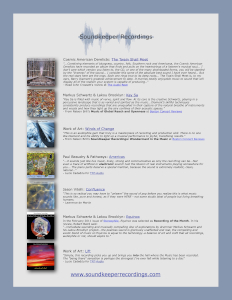 Welcome to the Soundkeeper Recordings Grassroots page. As an artisan label, we take pride in our relationships with our artists and with our customers. As a Soundkeeper Recordings listener, you can help us grow and ensure future releases by helping to get the word out to folks who may not yet have heard of us or our latest releases. Download, print and share our flyers to let folks know about the label and about your favorite Soundkeeper artists and albums. Give these to your friends, pass them out at meetings of your local music or audio society and post them (legally of course) any place that will allow you to post them. Post to web groups you participate in, where folks might be interested. Tell them about Soundkeeper, even share the flyers (if allowed). 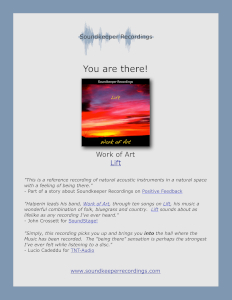 If you’ve got a blog, write about your favorite Soundkeeper artists and albums. If you don’t have a blog and feel so inclined, start one. 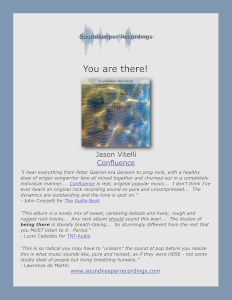 Play Soundkeeper releases for your friends and for groups of folks that might be interested. 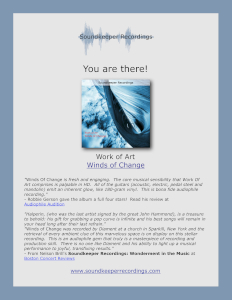 If you listen to music at your place of work, add some Soundkeeper Recordings to the rotation list. 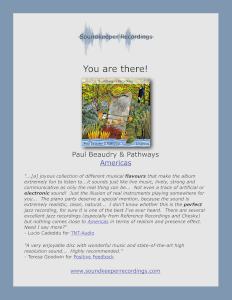 Contact your favorite music and audio journals, both print and on the web. Tell them about Soundkeeper Recordings and ask them to review your favorite Soundkeeper albums. Ask us for a Soundkeeper Recordings bumper sticker for your car, instrument case, attache or any other smooth surface. Contrary to typical record industry practice, publishing rights to the compositions remain 100% with the composer - where we feel they belong. All Soundkeeper Recordings are recorded “live” (for the microphones) in real stereo, with only a single, matched pair of high resolution microphones. There are no overdubs, no mixing consoles, no compression, etc. Each recording is a document of the performance. No Soundkeeper Recording is a casualty of the Loudness Wars. We leave the dynamics of the performance intact, 100%. Loudness is best achieved with the playback volume control. In addition to our regular CDs, Soundkeeper offers up to six custom burned formats, including 24/96 and 24/192 high resolution files-on-disc for use with computer music servers. 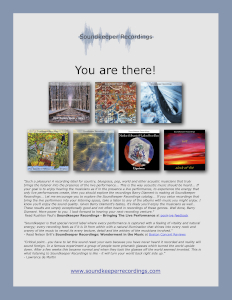 Please participate on our Soundkeeper Recordings Listener page. Send us a photograph of you, either in front of a Soundkeeper Recordings flyer you've (legally) posted or a photo of you holding your favorite Soundkeeper Recordings disc(s). We'd also love to see photos with some landmark from your locale in the background, such as a famous spot in your city or town. Wherever you are, show the Soundkeeper flyer or album(s) in the photo with yourself and we'll post the photo on our Listener page. 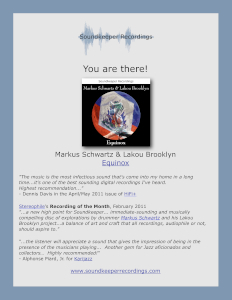 We would like our Listener page to reflect the international community that has embraced Soundkeeper Recordings. Along with the photo, send us your name and the city or town where you live (or just the state, if you prefer). We'll use your first name and location in the caption. Click on a thumbnail to view a flyer or right-click to download it. On a Mac, you can also option-click to download. Show the world you care about music, musicians and sound by sporting a stylish Soundkeeper Recordings bumper sticker on your car, instrument case, attache or any other smooth surface. To get yours, simply email us with your mailing address and we'll get one out to you right away. The bumper stickers are residue-free, should you choose to move yours to another location. And if you want more, just ask.